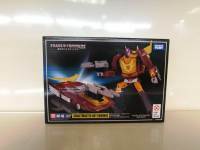 Via Tfcn賽博坦新聞台 we can share our first image of Takara Tomy MP-40 Hot Targetmaster Hot Rodimus Packaging. 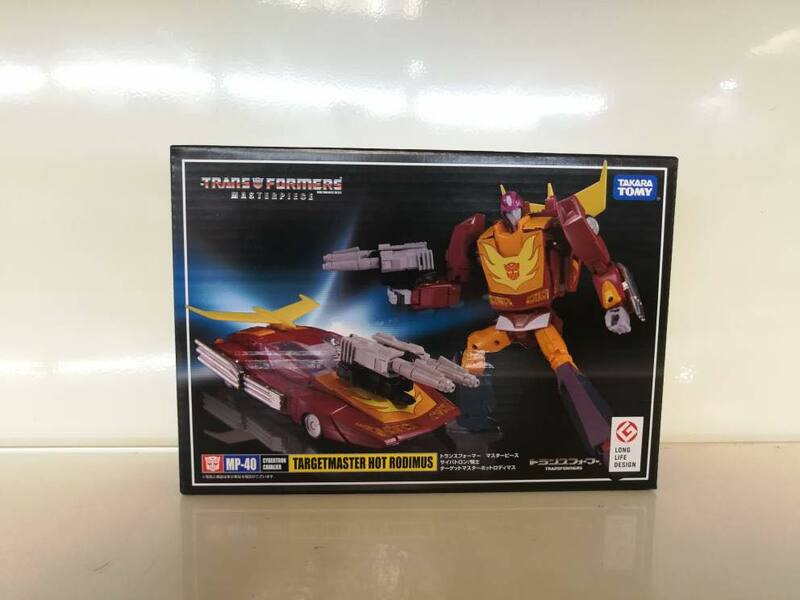 MP Hot Rodimus (Hot Rod) is a repaint of previously released MP-28 Hot Rodimus, based on his appearance in “The Rebirth”. He will include his Targetmaster partner Firebolt, a redeco of the Offshoot figure included with Hasbro’s Masterpiece Rodimus Prime. The box has got the classic style of other MP releases, featuring the robot mode on the right and with the alt mode on the left. You can be sure that the figure will be shipping any time soon. Have the arms loosened up in robot mode under the weight of Firebolt in gun mode? Nope. Still solid from my use. That is what I shall be doing with mine, who has now been ordered at long last! With Hot Rod, I think I'll try and remove the white from his pelvis, the pink from his helmet, and possibly the paint from his shins, but I'll wait to see how he looks in hand. Eventually I'll pick up MP-28 and swap windshields between them, too. I look forward to finally having MP Firebolt in toy colours, and to appreciating the Hot Rod mould properly (not worrying about chrome, or looseness). I'll report back at the end of the month! Get some tamiya white and tamiya black acrylic mini paint pots and mix until you get the right colour, then dab it on with a brush. Nah. From playing with it a lot. Transformered over 25 times at least. Got it since release. It’s a fun figure. Did it come out of the box like that? Paint started chipping nasty at the face of my Targetmaster Hot Rod. Anyone recommend any good touch up paint? Buy in the states or Japan? I may buy a second for displaying. Transformed the crap out of him. Finally got this guy , though I feel my need for a new mold / new character hasn’t been quenched . He’s just sooo …. ehh..
Yeah ordered via SAL to Poland, it was only 580 yen, so 6780 total. Made me realise just how much value you get out of a masterpiece Transformer of this type compared to a similarly priced Figma. 6200 yen on amiami right now, snatched one up. I've bought a ko of mp 28 a month ago, delivered just now decided I could go for the new one, since they fixed the chrome. How's SAL unregistered shipping lately? I used to use it a lot in the past and never lost anything, but the last time I used it was over two years ago. For now I put it on air small packet, but that's almost twice as expensive. I'm not crazy about MP 28's accessories myself. I thought the sculpt on the two guns really sucked and looked nothing like the original toy's. I hate the bulbous ends of the barrels, and they don't have the "wings" over the handle which I consider the defining trait of Hot Rod's guns. The fishing pole is dumb and I left it in the box, along with the over sized hand-saw. I never pose him with the guns cause he rarely, if ever, had the guns in the cartoon. He usually used his arm pipes to fire. As bad as the guns are, getting it in the same color as his whole body is just awful. I know it's based on the lazy cartoon, but blech. Looks terrible. I left it in he box too. The Targetmaster is the only accessory I really like between both releases! And even that is fairly ridiculous looking as a gun! Nowhere in my post did I say they should have included the SAME accessories. I said they included LESS accessories. There's a difference. I agree, the fishing rod was a waste of plastic! I like the skinny saw. I don't mind the guns, but TT could have included a new set that is more accurate to original toy's. Just don't pick on the hand saw. One day you will get a pizza that hasn't been properly cut, and that little Hot Rod will be there to save the day! And it's a shame TT won't make any improvements on a reissue/paint variant. I'd be all over this if they had improved that front skirt and made it with dedicated flaps for each leg. I like the maroon color, too.. I'm torn because there are some fine things going for it, but if only TT went just a tiny bit further. Takara have never changed the moulds for any repaint. Can you imagine how much people who bought MP-28 would complain if this repaint (with a less popular colour scheme) had significant improvements? It's not going to happen. Meh, it'd be the same amount of complaining EVERY TIME. Or it'd be about something else….and then they'd just wind up buying the thing anyway and the next one. It's because they are based off the prototypes (which is what the show used). The toy's production guns have a bunch of reinforcement plastic around the gun barrels, etc.